Next to the historic data war on the Medieval Warm Period, the data war on the 1940-78 perhaps stands as the most bitter and intense climate disagreement. 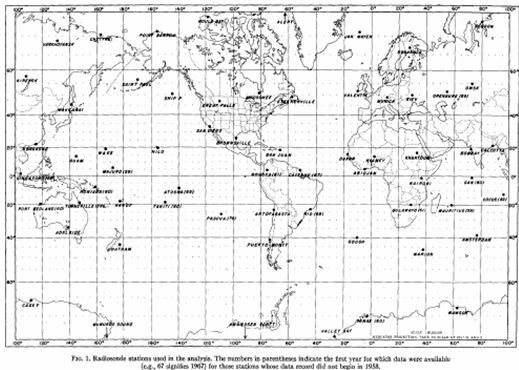 This is a follow up to the article: Temperature corrections of the northern hemisphere. 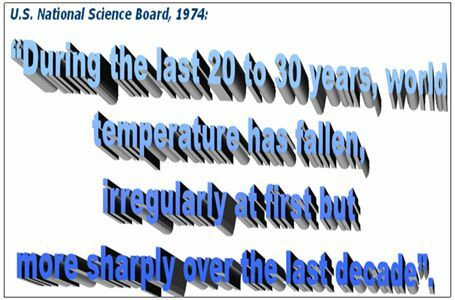 Changes of temperature data seems to occurs in several areas: Temperature station data, balloon temperature data, SST data, tree ring data, program fudging, cheery picking of data by scientiests, cherry picking of scientists by IPCC etc.etc. 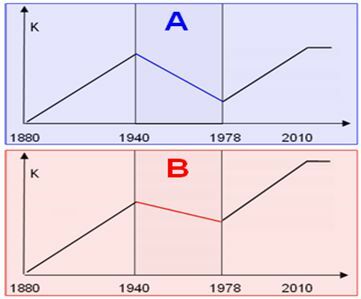 What happened to the great temperature decline 1940-78? 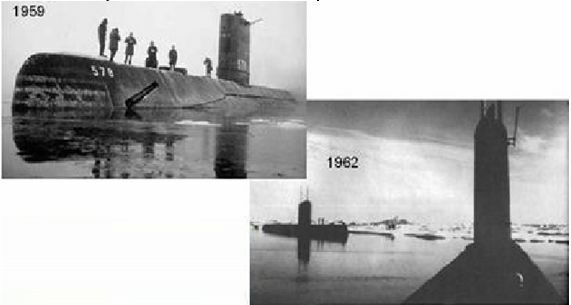 How did version A of 1940-78 temperatures change into version B ? 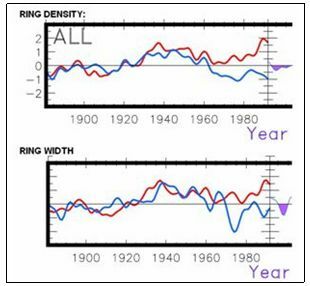 “Fall in tree ring data matches real temperatures 1940-60, but after 1960 the fall in “real” temperatures cannot match tree ring data”. 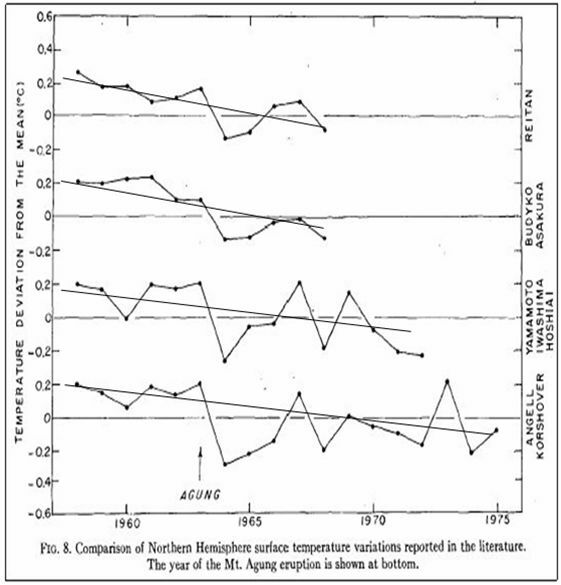 But, in the quote in fig 2, 1964-74 is described as the sharpest temperature drop. In general, the biggest differences between old pre-1980 temperature sets and new post-1980 temperature sets are located in the years 1958-78. For some reason, just when satellite data starts in 1979, the differences get smaller. No one really corrects temperature data far from satellite data, it seems… – and then we have the argument: “Land temperatures matches Satellite data”. (All temperature data sources shows more cooling in the NH than the SH for 1940-78, and therefore using tropic in stead of NH Raobcore temperature data is not increasing the cooling in data 1940-78). As usual in the climate ”science” we see that the most recent versions of adjusted data happens to show more warming trend. But still, Raobcore is dynamite. We know that all sources of temperature data confirms steady temperature decline 1940-58, but Raobcore confirms the ongoing significant fall of temperatures 1958-1978. 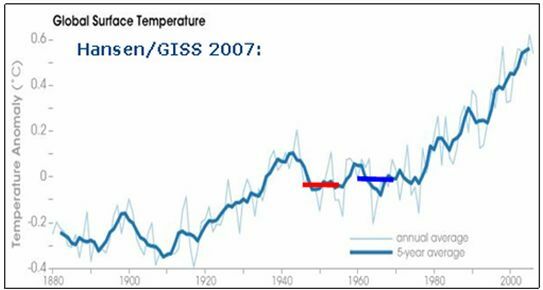 We cannot see the whole decline 1940-1978 from Raobcore data, but for 1958-60 we see same level of temperature as in the 1990´ies. Now lets go back to the National Geographic, “Mathews 1976” temperature set. – and as updated after 1958 by H. Asakura of the Japan Meteorological Agency using 1958-75 temperature data by Angell and Korshover. It appears that temperature data used by National geographic 1976 is based on peer reviwed data. Fig 8 + Fig 9. In all cases incl. 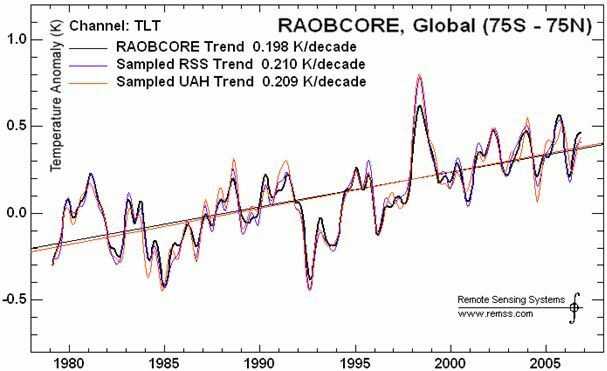 Raobcore we see trends that confirm temperature decline 1958-75 around 0,3-0,4 K, roughly estimated. I dare say this work is indeed showing results from a larger absolutely serious and professional project. Impressive. 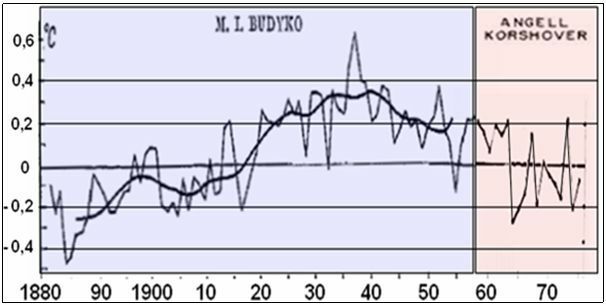 Budyko data up to 1960 is gathered monthly temperature anomalies carries out by the Main Geophysical Observatory. 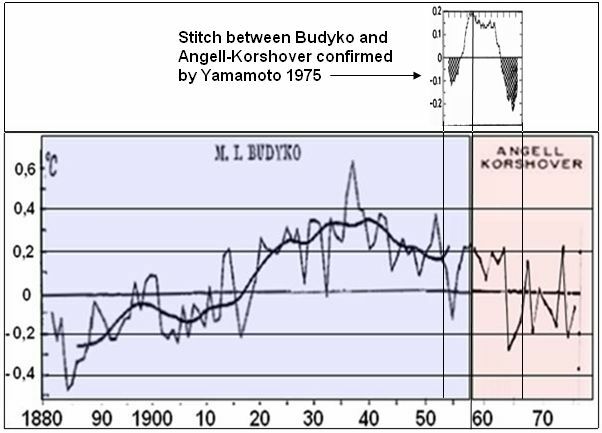 Stitching Budyko and Korshover: It so happens, that the two datasets has a minor overlap period around 1958-60. Fortunately in both temperature sets around the overlap years 1958-59 appears are rather constant, and therefore the stitch appears pretty straight forward, not truly risky. It seems that Korshover uses the same zero anomaly as Budyko, since the 2 data sets “melts” together when stitching for same zero anomaly (but I cant see what baseline years the zero anomaly is defined for). The correctness of the stitch is further supported: We can have rather high confidence in the temperature trend of 0,3K 1958-75 as shown above from 5 data series. Therefore the resulting graf must have 1958-59 around 0,3K higher than 1975. The 1958 (and 1959) points of Koshover data is right on the trendline and therefore appears solid to use. Any significant error from the stitch should most likely come from using a wrong point at the Budyko graph. The stitching is further supported, see fig 14. Hansen (1980) has approximately the same trend of data 1957-65 as National Geographic. 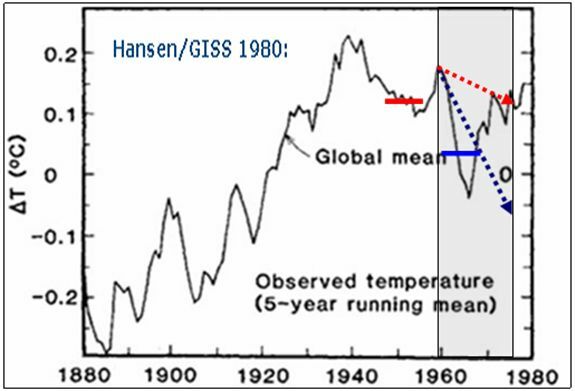 Hansens trend changes significantly from NG mostly after 1965. Addition: There are 3 points where you could stitch Budyko and Korshover, 1958-59-60. The1958 and 1959 korshover points are spot on the trend graph and thus represents the overall Korshover (and Raobcore etc.) far best. The 1960 point of Korsover is far longer from the trendline and thus represents korshover poorly. The Stitch wa carried out by the Japaneese Meteorological institute, and their apparent chocie o 1958 seems logic and correct. No doubt, the stitch is where National Geographic 1976 data might be attacked by the critics, but as I´ve explained it looks like a rather reasonable stitch. Mitchel has temperature decline 1940-58 around 0,26 K.
So all in all with other data sources (Newsweek/NCAR/NOAA etc.) 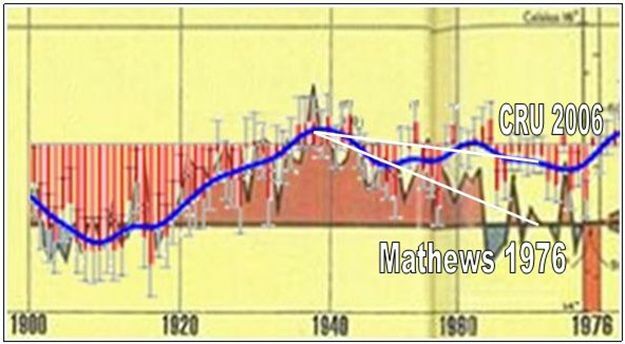 mentioned, ”Mathews 1976” appears to be a rather valid piece of science based mostly on peer reviewed work, in agreement with Raobcore data which eventually confirms the temperature decline roughly 0,4 K from 1940-78. So why cut the tree graphs and thus hide the FULL 1940-78 decline? Finally. Lets checkout what Hansen did to his data set, GISS. It appears that Hansen in the early 1980´ies did not use the above data, except for the Mitchel graph that ends in 1960. 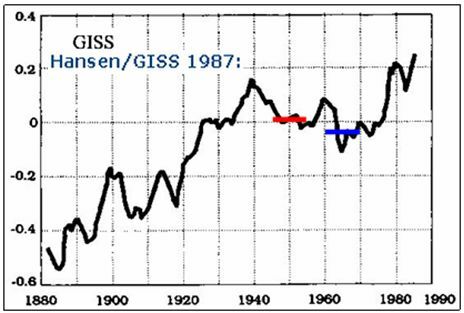 For the years 1958-75 Hansen/GISS (1980) only finds a temperature decline of approximately 0,07 K (red) in stead of the 0,3 K decline (blue) from Raobcore, Korshover etc. This article was posted in Climate Change. Bookmark the permalink. Follow comments with the RSS feed for this post. Both comments and trackbacks are closed. 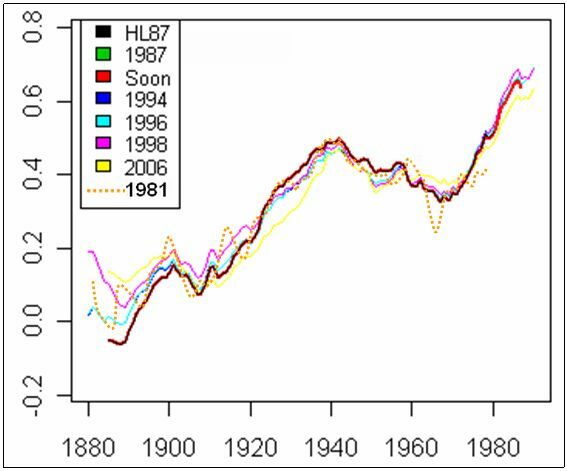 Where should we expect UHI in temperature data 1979-2009? Briffa: For the record, I do believe that the proxy data do show unusually >warm conditions in recent decades. I am not sure that this unusual warming >is so clear in the summer responsive data. I believe that the recent warmth >was probably matched about 1000 years ago. I do not believe that global >mean annual temperatures have simply cooled progressively over thousands of >years as Mike appears to and I contend that that there is strong evidence >for major changes in climate over the Holocene (not Milankovich) that >require explanation and that could represent part of the current or future >background variability of our climate. I think the Venice meeting will be >a good place to air these isssues. © 2019 Hide the Decline. All Rights Reserved. Proudly Built with Startup WordPress Theme and WordPress.